giov’s AchillesBlog » Hello world! 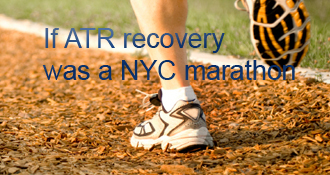 giov has completed the grueling 26.2 ATR miles to full recovery! 11 weeks is a very long time to be on crutches. Are you using a walking boot now or just shoes? Either way, walking is going to feel pretty weird at first. Your cast was probably squeezing your foot so it couldn’t swell up. For a couple weeks post-op after my soft cast was removed I had the blood rushing into my foot sensation whenever I got up and my foot would swell up quite a bit if I was up for an extended period. I started wearing an ankle length tight sock and that eliminated the swelling from my foot although it still swelled up above the top of the sock. I understand there is such a thing as a “compression sock” specifically designed to prevent swelling. Ouch cserpent sorry for your fall. For me I haven’t been able to get a hold my surgeon, but I do believe I have not re-rupture. Mainly because, I don’t have pain (except the re-opened wound), no swelling, the tendon area feels hard when I touch and I have partial ROM. I even went to my first PT session last Friday (after my fall), I trained some minor ROM movement exercises, which I can also do home. The PT scheduled me for 2 sessions a week, with the first sessions being ROM exercises (assisted and unassisted), gradually moving to strength exercises. I fell on my crutches once and hubby banned me from using them - LOL! Fortunately I had a knee scooter and I got quite adept at taking it up/down the stairs. Hopefully you didn’t rerupture! I too was astonished on the amount of muscle loss (after 7 weeks cast NWB) and the insane amount of dead skin, I’ve been removing. I’ve been doing some very minor ROM movement on my foot, and today I’m noticing a bit of an improvement on my foot’s ROM. Two n a half week will pass in a flash you’ll see, wish you a good recovery and hopefully your specialist will give you the ok for your boot to come off. Great to read your story. Any update on how things have been going? I’m keen to hear how everything is for you. That’s great to hear the cast has been removed. Hopefully it doesn’t take too long for you to be FWB. I’ve taken my foot out of the boot a couple of times now and the calf muscle has completely disappeared for me. I compare left to right and I am astonished how much muscle is lost. I’ve got about 2 and a half more weeks before I see the specialist and hopefully the boot comes completely off. Today’s 2nd follow up went well, the doc removed the cast and the wound is healing nice, though it hurts a bit. I still however must use crutches for support and limited PBW. This week will be my first scheduled PT sessions. The atrophy on my right calf is noticeable, and lack of range of motion. It felt good my right foot touching the ground, but I really need the PT to regain ROM, and strength. How did the 2nd follow up go with the specialist? Thanks mattypicks for your words of encouragement!! It gets a bit better with every day that passes, and looking forward to regaining my regular routine asap. I wish you a good healing on your recovery period, hang in there, and each step brings us closer to put this injury behind. I’m currently at week 4 (non surgical) after injury and life is definitely a lot harder. I’m sure that once this is all over for you, you will look back and take pride in how much strength you showed during this painful time. Keep your head up, you are not too far away! It’s amazing the differences in surgeons. It’s been 3 weeks since surgery, in eeek 2 I was given a WB cast. I may be over doing it some by according to my phone I’ve walked 3.5 miles today. I get a traditional walking boot this week. The only issues I’ve had has been the wearing from my cast, hopefully it means the swelling is gone. At the time of my cast I asked the surgeon if I could go elk hunting and he stated as long as I wore a high top hiker. This trip would be 6 weeks from the date of surgery. I’m a little nervous but he said the pain would dictate what I could do. So far it’s been minimal. Hi Susan. In my case I think I might have either high pain tolerance or the pain wasn’t that much. I’ve mostly keep busy by reading books (lots), tv and spending time with family. In just over a week will be my first doctor’s visit. Hopefully to take off my cast off and some WB (either PWB or FWB), and when I can start with PT. Thanks for your words of encouragement, and glad for your progress thus far, patience and determination are the key for this recovery. How did you manage neutral at 3 days post-op? That doesn’t sound comfortable!! You must have a high pain tolerance. 6+ weeks off has it’s pro’s and con’s. I hope you have found things to keep you busy while taking care of your ankle. I’ve just started walking a mile at a time and hadn’t realized the thigh atrophy on my injured side…and that was after only 4 weeks NWB. It sounds like recovery protocol’s very greatly between surgeons and certainly depends on the level of tear and surrounding injuries (i.e. where the rupture occurred, if bones and other muscles/tendons were involved, ect). Luckily, mine was the normal mid-heel/calf complete tear and no other significant structural involvement (well, they never did any imagining but I’m healing well with very little set backs so I believe that to be the case). I found that every transfer to a new mobility level (NWB to WB in boot then boot to walking) sets me back. However, the progress has been significant within just of week of each transition. I hope you have as much/more success. Thanks for your message. I will be off work for about a month and a half or so. I had the partial plaster during the first 3 days post op, then they put me in this hard cast at a neutral position. No weekly adjustments or follow up whatsoever. I discussed this with the surgeon, before I was discharged from the hospital, he told me there is no need to come in for check up, unless I was in overbearing pain/discomfort, which so far hasn’t been the case (thank god). I’m trying now to use to ice pack while elevating my foot, which does help to some extend. How long are you off work? I didn’t know what to expect as far as recovery so expected to be back in 3 days. I went back 1/2 time after a week off. It sucked!! You are already 4 weeks NWB and 2+ more to see the doc? They aren’t doing weekly angle adjustments? I did have a similar burning/tingling sensation while in the cast (weeks 2-4). I tried icing then (putting ice in a bag and laying it over my foot/ankle) but it wasn’t very successful. However, I’ve slept with my ankle elevated above my heart the entire 11 weeks since my rupture and have minimal issues with swelling. That and ice have been my best friend though. I had 2 weeks of splints (partial plaster wrapped with ace bandages) so I could ice & compensate for swelling. I had 2 weeks of fiberglass casts. Then 4 weeks of a walking boot…so I could take it off and ice at night. I hope you find relief. Thanks pjhalifax and cserpent for your comments. The pain has since subdued, just the usual swelling. Going through this third week is something. I had pain like that off and on for the first month or two. My doctor said, more or less, that I’d feel stuff like that. I just imagined that it was nerves and other tissue growing back together and that took my mind off of it. I didn’t really have any pain. I took the prescribed pain pills for 2 or 3 days then went to half dose for another 2 days then just took Tylenol when I was achy or uncomfortable. I didn’t have any pain like you experienced. Keep icing it to help reduce the swelling. I ditto emupilot - but then I was a disaster on crutches so for me the knee scooter was a requirement or I probably would have messed up my foot again. I feel for you being NWB for 6 more weeks. I went through that too. It gets tiresome, but it is doable. Good luck and keep that foot elevated and ice behind the knee when it swells. Keeping the swelling down is very important at this stage. For my first 3 weeks I had to elevate 90% of the time and during that time I was regularly icing as well. Thanks for your msg. Right know I try to keep my healing leg up on a couple of pillows, which helps a bit. I don’t feel quite the pain that I was feeling in the first few days post op. Though I was prescribed pain killers, I’m just using on a need only basis. My doctor seems to have decided for the very conservative protocol in my case. I was wondering if I somehow needed to do a check up on my wound/stitches during these 6 weeks, but my surgeon replied not necessary, unless I’m in constant pains (above comfort zone). Indeed, not a club I was looking forward to be part of. Being on week 2 post op now, which are indeed the hardest thus far. From being independent doing all kind of stuff, to now just laying on the couch or bed, it’s something I’m starting to just getting used to. Right now I’m taking a day at a time and thinking positively for my recovery. I will check the knee scooter, thanks for the recommendation, and thank you for sharing your story, wish you a good recovery. Greetings from another tennis player with a rupture! Sorry you had to join us. I found the first 4 weeks to be the toughest, so I hope you’re out of that phase soon. I had the swelling you described for quite a while - it slowly got better, but even after I got my boot off I wore a compression sock for a week or two to help with that. Good luck in the early stages of recovery! Lots of good resources here if you have questions. Hello giov, welcome to the club nobody wants to join. That’s tough that you will be NWB for another 6 weeks. Have you thought of getting a knee scooter? That is SO much better than crutches for going from couch to kitchen to bathroom, as long as there aren’t any stairs in between. The couch phase is really boring, but you can look forward to small victories like one day brushing your teeth while standing on two legs! I’m around 3 weeks out from my injury and surgery. My rupture was relatively high, where the muscles are attached. Initially I had that uncomfortable feeling immediately upon getting up that my foot was filling with liquid, but that has subsided. I still have swelling, especially around the outside of my foot, but it’s gotten better over the last week. I remind myself that each day is better than the last, even if progress is slow. giov’s AchillesBlog is proudly powered by WordPress and WPDesigner..